In this small, quiet town, during one of the most festive times of the year when love and reverence for Jesus, born of the chaste Mary, is widely celebrated by Christians the world over, the United Muslim-Christian Forum (UMCF) embraced these auspicious weeks as an occasion for mankind, the family of God Almighty, to come together in unified adoration and veneration of the birth, character, and life of the Messiah, Jesus, son of Mary, the Pure and his noble contributions to humanity. BINGHAMTON — In this small, quiet town, during one of the most festive times of the year when love and reverence for Jesus, born of the chaste Mary, is widely celebrated by Christians the world over, the United Muslim-Christian Forum (UMCF) embraced these auspicious weeks as an occasion for mankind, the family of God Almighty, to come together in unified adoration and veneration of the birth, character, and life of the Messiah, Jesus, son of Mary, the Pure and his noble contributions to humanity. Upon entering the beautifully decorated Empire Ballroom of a Binghamton hotel to attend this celebration -the first of its kind- an atmosphere of love and brotherhood reverberated around the room and enveloped every newcomer. The program started with all standing as the Tennessee Islamic song group, Banaatu Salaam, (Daughters of Peace) performed an inspiring rendition of the National Anthem. Master of Ceremonies, Mr. Idris Johnson, made a short and inspirational prayer thanking Almighty God for this auspicious assembly of peacemakers, those who thirst after righteousness while gathered in a world of turmoil. With this, all were asked to look to the right and left, and while clasping hands with their neighbors, to declare, “You are my brother (or sister).” This unique gesture of love delivered with such warm-hearted enthusiasm hit the mark. The guest speakers then took the podium, starting with Father John P. Donovan of St. James Catholic Church of Johnson City, who expounded upon the illustrious noble character of Jesus, the Messiah, and our obligations, as those who love and revere him, to serve mankind. 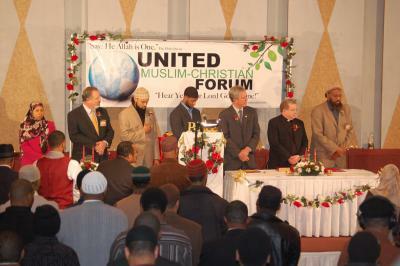 Next, Binghamton Mayor Matthew Ryan greeted the audience with the Islamic greeting of peace, “As Salaamu Alaikum.” Mr. Ryan said that after extensive research seeking to discover any other instances where Muslims and Christians were coming together to celebrate the birth of the Messiah; he was saddened to find no others had taken this historic step. Yet the Mayor also felt the community members residing in Binghamton and the surrounding areas deserved congratulations for being the first to have such a historic event, and he was honored to be a part of the festivities. Mr. Ryan has done much to maintain working relationships with the diverse members of his city. Next, Rev. Arthur Suggs of First Congregational Church of Binghamton began his speech in the name of Almighty Allah. He noted that while the outer self keeps one involved in things of this world, the inner self seeks unity with its Creator. Rev. Suggs continued by sharing two things he holds dear and keeps in his office. One is the statue known as ‘Madonna and Child.’ “When I look at the affectionate way the holy mother looks at her child, I am reminded of how the Almighty views us, His creation, and His love and concern for us all.” Rev. Suggs then pointed to the back of room where Arabic calligraphy of the 99 Most Beautiful Names of Allah had been hung and reaching into his pocket, pulled out a small rosary on which he said were 33 beads and three counters. The reverend mentioned that he often sits and contemplates His Creator and calls on Him by His 99 Attributes, each one in turn, using the beads. “Just imagine the place you reach when you call on God by His Most Perfect Names, Most Merciful, Most Kind, Most Loving, Most Beautiful,” he earnestly exhorted the audience while turning each bead. AbdurRahim Harleston-Aliy then performed the famous hymn, Amazing Grace. Each word was clear and crisp and delivered with such feeling that no eye was dry by the time he finished. The Hon. Hussein Adams, who was also appointed Ambassador for Peace by the Universal Peace Foundation (UPF), spoke briefly about a charter for unity and peace that will soon be presented to leaders all over the world as well as interfaith counsels. Thereby the world will come together and pledge that no longer will Muslims and Christians be duped into fighting. “We state that our Christian brethren are closer to us than [the sects] Wahhabis and Shias. We know the third party whose hidden hand is trying with all its might to bring about the ultimate clash of civilizations between Muslims and Christians.” Assuring all those present, the Honorable Khalifa went on to declare that “this will not happen!” He also stated that although so-called Christians like Christian Action Network (CAN) aim to create and incite hatred, they have been exposed and will continue to be exposed. The final performance of song was given by Ansarudeen who sang ‘Radiant Star’ written for this occasion about the Blessed Jesus, son of Mary, the Pure. “He’s a shining radiant star amongst men. The evening concluded with Hon. Khadijah Smith, deputy chairwoman of Muslims of the Americas, bestowing gifts to the speakers that had been sent by His Eminence El Sheikh Mubarik Ali Shah Gilani. Many American Muslims & Christians attended the celebration of Jesus (son of Mary) birthday, including clergy members, governement officials and community leaders.